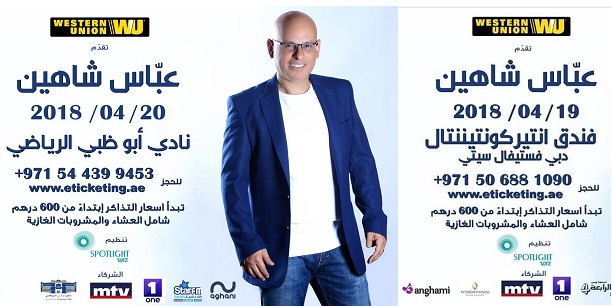 Stay tuned for upcoming events for Abbas Chahine in near future. Abbas Chahine has graduated from the faculty of fine arts in the Lebanese university with a masters degree in acting. His early work was as a singer and musician with the famous composer Ziad Rahbani and participated in many albums and plays written and directed by Ziad Rahbani like: 'Bekhsous el Karame wel Sha3b El 3anid' And 'Lawla Foshat el Amal'. His work with Ziad included acting and singing as well as playing as a percussionist in many concerts across Lebanon. He was also involved in radio work in programs like: "El Akl Zineh'. Abbas was also a member of Al Mayadin the musical group of legend Marcel Khalife in which he had an active role as a singer and percussionist and was an active participant in Marcel's concerts in all over the world. His move to the television business was with the musician Ahmad Kaabour with whom he did many projects. Abbas put his voice on all the La3younak series which were the trademark of Future Television and he also acted the main role in the popular Ramadan series 'Halawnji ya Ismail' while at Future Television his tremendous talent paired him up with director Nasser Fakih and since then he has been a main star in many programs like 'Caracas', Ahla Aalama', 'La Youmal', 'El Ossa w Mafiha', 'Khedna B Helmak', 'La Shaghle wla Aamle', 'El Kell aam Bi Massil', 'Kell Yom Shi' and many others and most recently 'moghamarat Abu Riad' during this period he also acted in movies like "Abu Riad Min Addo' and currently he is performing in 'Mafi Metlo' On MTV Lebanon as well as 'Mafi Metlo Show' a play that has toured Lebanon the arab world , USA and Canada. Abbas Chahine is married and lives in Beirut with his wife. Best Viewed at 1024 x 768 pixels and above. This Page loaded in 0.0887 seconds on Fri, Apr 19, 2019 (06:38).